You are here: Home / Lifestyle / Health & Beauty / Self-Care is Important: Take the Self-Care Day Challenge + Giveaway! Self-Care is Important: Take the Self-Care Day Challenge + Giveaway! Take the Self-Care Day Challenge! Lately, there has been a lot of talk about self-care. 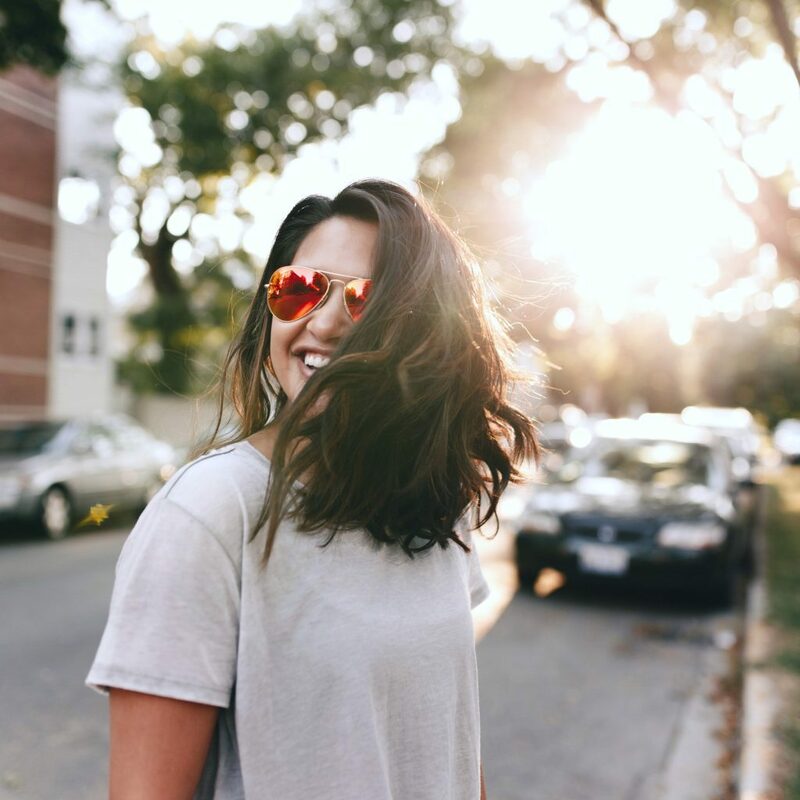 As our lives get busier, prioritizing self-care becomes increasingly important. Many of us think of self-care as practicing yoga, a day at the spa or even spending quality time with friends. While these are all great ways to relax, there is much more to it! The concept of self-care is about empowering individuals, families, and communities to practice healthy habits, prevent disease and cope with illness or disability to achieve optimum health. Taking better care of ourselves by utilizing the products available to us not only helps Canadians lead healthier lives, it also alleviates strain on our healthcare system! Making a commitment to practice self-care has so many benefits. That’s why Bayer, a global health products leader, is working to educate consumers on how Better Self-care for a Better Life can make a difference in the quality of life while improving healthcare sustainability. 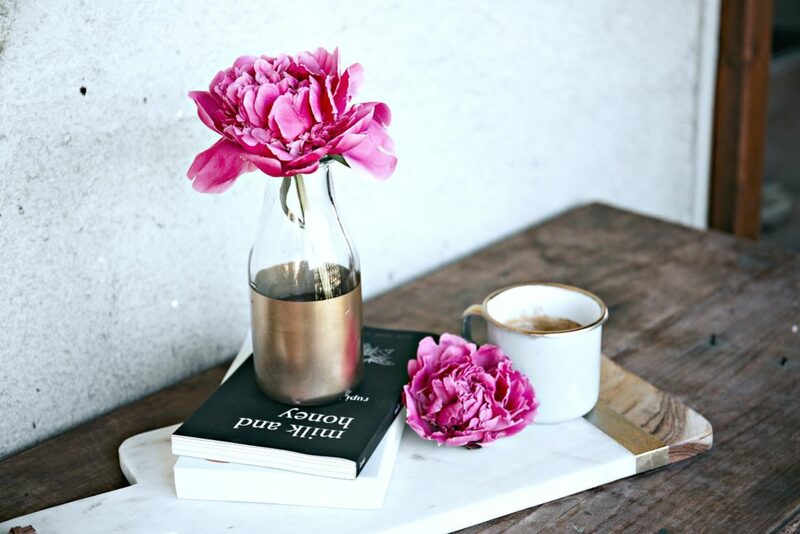 One of my favourite ways to make time for me is to pick up a good book, pour myself a cup of tea or coffee, and just read. It really is something I don’t have time for most days but, I make sure to do it as often as I can. A great way for me to unwind is to get fresh air. I try to go on a walk with my family daily. We get to talk, explore new trails or walkways, and really enjoy nature. I make sure to always have a good pair of walking shoes and use Dr. Scholl’s inserts for back pain. That way, I can walk and not have any pain afterward and we are getting our daily steps in. Not to mention, I suffer from allergies and during peak season, I always take my Claritin. For me, it is sometimes the only way that I can function. I don’t often get a chance to go for a mani/pedi but, I do so when I can. When I can’t go out and treat myself, I throw a little spa day for myself at home. I choose a fun colour or just clean up my nails and toes, and leave them clear. I love the feeling of it! Whenever I get a chance, I will grab some candles, my favourite bath bomb, run a bath, and just enjoy. Darasak will often run a bath for me after a long day or when I have a headache and body ache. I’ll take Aleve and relax. As much as I love being a mom, it isn’t my only job or purpose in life. Of course, they are my everything and everything I do is for them but, taking some time for adult interaction is absolutely necessary. At least once a week I will meet up with a friend, my brother, sister, or parents and just enjoy a fancy latte or lunch. It lifts my spirits every time and I am a better mom for it! In support of International Self-Care Day on July 24th, I challenge you to share your self-care practices with me. To help get you started, Bayer has created a self-care calendar with one tip for each day of the month. Get the Self-Care calendar, here. I will also be giving away ten $15 Amazon gift cards so you can purchase your favourite self-care products! 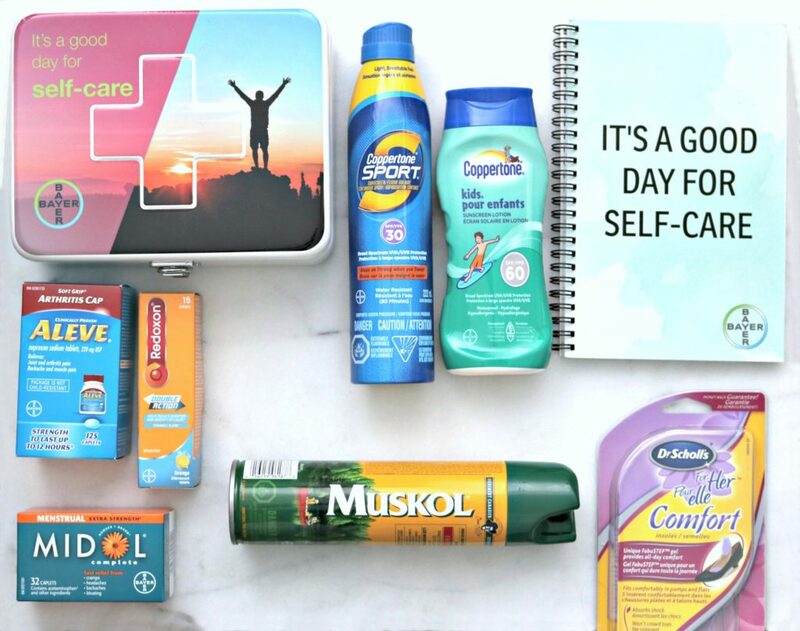 In celebration of Self-Care Day, Bayer is running a Buy 3 for $10 promotion through Amazon.ca on most of their brands at https://www.amazon.ca/adlp/bayercanada. To enter, all you have to do is share how you practice self-care by leaving a comment, tweet me, @whispersinspire and use #SelfCareDay for your chance to win! You can do that all by using the widget above! This contest is open to Canada only and ends on July 31! So, how do you practice self-care? I practise self-care by exercising,eating healthy and getting proper rest.I love laying in a hot bath with a good book occasionally . I try and practice self care by trying to eat good foods for my body daily! I’ll be having a pedicure and practicing yoga! I go for regular massages! On self care day I will be relaxing at a friends cottage. You are so right! Self care really is important and we all need to take some time to think about looking after ourselves and making sure we love ourselves just a little bit. Self care is hard but I treasure the small moments.. like waking up before the kids and enjoying a coffee or tea, or taking extra long in a bubble bath when the kids fall asleep. One #Selfcare thing I’d like to do is enjoy a pregnancy massage! I really should practice more self-care. I tend to lose myself and my needs in the shuffle of the day to day. I can see that, I do too sometimes. I take time for myself everyday. As an anxious person, I get so stressed if I don’t get a bit of solo time each day to clear my head. My favorite way to spend my down time is listening to music because I find it to be the best de-stressor. It sounds cliche but music really does soothe my soul. Yes, music is the best. I love the idea of doing something related to self care every day of the month. My favourites are baths, face masks, and adult coloring books! I walk daily, I try to eat healthy, drink lots of water and take multi-vitamins. I like to take staycations to get some me time to go get a massage. I am actually going for a 45 minute massage. I didn’t plan it that way but a great way to celebrate. Yes, I practice self-care daily. I love to read, so I make sure I have time to do that on a daily basis. It helps keep me sane and friendly. OMG, I want to read daily! I try to take time for myself at the end of each day to relax with a cup of herbal tea. Me and self-care have never gotten along. I don’t make it a priority (I know.. I know). Things will change though. I’m determined. Girl, I think we all get like that once in a while. This is so important. I just realized that I spent years not really caring for myself and it took a toll on my confidence. I’m totally changing that! I finally need to! It’s so important to practice self-care, and to recharge on a regular basis. Life is so busy and it is easy to neglect taking care of ourselves. I practice self care by taking a relaxing bath once in awhile. I exercise and get lots of sleep. this is such a nice plan every weekends thats make your day so relax and get rest and a lil bit unwind ., thanks for this great beauty tips.. I try to take time to relax and read for self health care. I treat myself to facials, mani and pedis now and then! On my self-care day, all I do is to sit at home, read a great book and have a cup of tea. Sometimes doing nothing is what we need. Self care sometimes gets placed on the back burner when life gets in the way but as I age, its always front and center now! I make sure I exercise daily, I have a skin care routine I adhere too and I ear much healthier,..in self care day, I’ll pick it up a notch!! EVERY morning, I take 20-30 min of alone time to just relax – it starts my day off right and without feeling overwhelmed from the get go! I like to take a bubble bath in the evening before bed. I try to get up a little bit before my kids do so that I can enjoy a nice hot cup of coffee in silence. I don’t always manage to get up first, but I sure enjoy the days that I get a bit of time just for me. Taking time for yourself is so important. I love to run or hike. I find it clears my mind and also I love the exercise, too. I take a nice hot bubble bath, a glass of wine, some music on, candles & relax. I am lucky I can take time for myself everyday, even its for a short time. For self care I go for massages twice a month which keeps my muscles loose and I just feel more relaxed. I have to be intentional with self care or the time just escapes me and then I am left flapping in the breeze. Yes, you really have to make the time for it. On self care day, I am having lunch with friends without the kids around. I like to set aside a least a small portion each day to read. Sometimes it may even just be a 15 minutes stint before bed. I like to spend a day out by myself shopping for groceries for my family. I take myself out for lunch too! Self care is very important. Thanks for sharing these useful recommendations! I love reading, going to the gym, and spa treatment for “me” time. I see a therapist regularly for self care. I like to take a little nap to take care of myself! I walk every day for myself and it has really become such an important part of my mental health. This is very good advice! I practice self care by relaxing and reading a good book. I know I need a bit of time to myself everyday, so I make sure I spend some quiet time reading or watching TV. I have been learning the importance of self care more and more. It is so necessary. I will take the time to have healthy meals and exercise on self care day. I try to make time for myself once in awhile. I try to do a little bit of self-care everyday by taking daily walks and also relax at the end of the day by reading a bit. Going for walks, hikes, jobs, or runs always do wonders for balancing out my emotions and thoughts. Glad to see that was on your list. Nice suggestions! I self care by relaxing with a good book. Right this second I’m enjoying a fresh hot muffin and coffee. The kids are still upstairs in their pajamas playing sweetly. Seize the moment. I practice self-care by taking time out for me and making healthier choices! I try to take time DAILY for myself – it is usually only around half an hour but that down time is so beneficial! I like to take a walk each day. I like to go for long walks in the park by myself to clear my head! One of the ways I self care is I walk my dog every day at my favorite places like the canal where there’s a great path and my dog gets to swim there so he can cool off. Our favorite place ! I practice self care by meditating. I make sure I get plenty of sleep for self-care. For a little self-care, I practice yoga! It’s good for the body and mind! I went and got myself some peaches yesterday. They’re my favourite, just for me. I ensure that there is a portion of each evening carved out for me to recharge. I’ll be taking a nap! Self care is so important and It takes time to take care of yourself. I like having a bath with a fun bath bomb. I try to eat a healthy diet and stay hydrated. i like to relax with a book after a nice hot shower. i also have a foot spa i love to just soak my feet. I don’t get much time but hope to sleep more. I’m making a cake today, just because I LOVE decorating! A nice hot soak in the tub at the end of the day is self-care to me! It’s nice to unwind and soak sore muscles! I like to set aside time to read a book. I like to sit back on a Saturday night and enjoy a few glasses of great wine and conversation with my husband. I make sure to take time for myself when the kids go to bed. Sometimes I’ll take a bath or read or bake. I try to have a bath nightly just so that I can relax and unwind and have 10 minutes to reflect. I like to sit on my porch on my new rocker for quiet time! I like to schedule time in order to have self care days/hours of a day. I like doing at home spa treatments like facials and mani/pedis. I make sure I use sunscreen daily. I self care by relaxing puttering around in my garden. For some self care, I take an evening off from the kids and family once a month. I love hiking – being outside in nature is my self-care as I feel at peace! A green smoothie several times a week helps me make sure I’m getting enough fruits and vegetables in my diet. I add milk to get a serving of calcium too. Good nutrition is one way I practice self-care. I’m planning my next self care time and it involves getting a pedicure for summer. I try to exercise and eat well. I like to go for a spa visit to get a massage for a little self care! I take a long daily walk. I like to take a bubble bath at the end of the day. I make sure to stay hydrated! That is the best self care. I finished my book on self care day! I self care by treating myself to a nice dessert once a week. I try to take an afternoon to read, on a weekend, about once a month. It’s one of my favourite things to do. I try to do a little something for myself daily, sometimes as small as a longer than usual warm shower, or washing fresh laundry so I have the fresh, warm, and clean experience when sleeping! For a little self care; I ensure I get enough sleep! It sounds simple- but it can be neglected easily and I know it affects me mentally and physically! I do a little self-care by not smoking or drinking alcohol! I self-care by taking a few minutes just for me everyday,even if it’s just a coffee out on the deck! For me self care is walking…walk to work…its 35Cout…walk to work…. its -40C out…walk to work…I’ve worked 10 hrs,…walk home..NO I don’t feel like walking home as I’ve worn steel toed rubber boots that give me blisters and bunions and corns BUT I know I have to do something at my age (54) to keep me mobile, even though I’d rather just be lazy. When my kids are out of school for the summer I usually only get time (or make time?) for self care about once per week – I find most of time is focused on family time. During the school year I try for at least 3-4 times per week. For one example, I try to walk to pick my kids up 3 out of 5 school days per week, so that I get some exercise in at least 3 days a week (since we don’t live super close to the school, it gives me a pretty good workout). I try to escape for a latte and a new magazine whenever I can – hopefully, that’s what I’ll be doing on self-care day! Self care is so important. I try to teach this to my daughter and we practice self care activities together. I like to go for a long walk on the local trails or a bike ride. I like to exercise as often as possible in my pool to keep fit. Sometimes I go for long bike rides too so I use a lot of sunscreen ,like Coppertone or BananaBoat. I also like to take Bayer extra strength aspirin for my joint pain. This is how I care for myself. Watching a favourite movie is always a treat. I do Aquafit and visit the sauna after, go for walk and eat well. I treat myself to chocolate once in a while! I self care by doing yoga. I hike and practice yoga and see movies!!! On Self Care Day I took a long hike and a bubble bath! I try to take time out for just me to play on the computer and do contests. I practice yoga as a form of self-care – it’s relaxing for the body and mind! I practice self-care by choosing healthy food and daily exercise! A bubble bath is my way to self care. I give myself a face and hair madk once a week as a bit of self-care me-time. I try and carve a little time at the end of the day to read for myself! I will be doing this and having a relaxing bath on self care day! My new way of making sure I care for myself is to do a little bit of stretching each day. I’ve found that even a few minutes of stretching makes a big difference in how I feel. I self care by relaxing and reading a good book. I love to read – that downtime reading is self care to me! I practice self-care by making sure to take time to make fresh garden based meals regularly, those keep me healthy. My kids are learning to love the vegetables we grow. I set time to read a novel. I like to read my book every day. I love to take a half hour hike by myself as self care! One self-care thing I do is making sure I get enough calcium each day. For me, the things I eat to get calcium are mainly, milk, cheese and yogurt. I take some me time every evening and go on a long walk or ride my bike! It’s a great way to relax and clear my mind!! I do a little self care by baking cookies by myself! I get up a few minutes before pur house explodes in chaos in the am to enjoy a quiet cup of tea. One way I practise self-care is to spend time reading – it’s like a mini vacation.